February 13, 2017, Adrian, Michigan – George Heartwell, Community Sustainability Coordinator at Grand Valley State University and former Mayor of Grand Rapids, Michigan, will address climate change on Wednesday, March 15, 2017, at Weber Retreat and Conference Center, 1257 E. Siena Heights Drive, Adrian. His presentation, “Climate Change, Cities and the New Reality” will be from 7:00 to 8:30 p.m. This presentation is free and open to the public. Mr. Heartwell will speak with community leaders earlier in the day, leading a discussion on how local communities can become more sustainable. During his three terms as Mayor of Grand Rapids, Michigan – from 2004 to 2016 – Mr. Heartwell helped the city to become more sustainable. The initiatives passed during his tenure included investment in renewable energy and the cleaning up of the Grand River, restoring its rapids and making it more suitable for recreational uses. 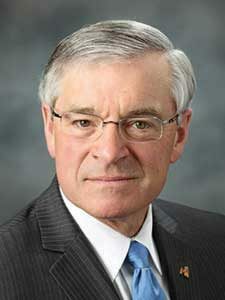 Because of Mr. Heartwell’s commitment to making his city more sustainable, Grand Rapids was recognized by the United Nations as the first Regional Center for Expertise in Education for Sustainable Development in the United States, and by the U.S. Chamber of Commerce as the nation’s most sustainable mid-sized city. Mr. Heartwell also received the first-place award for climate protection from the U.S. Conference of Mayors. For further information about Mr. Heartwell’s presentation, please call 517-266-4000. Weber Center is located on the campus of the Adrian Dominican Sisters’ Motherhouse.